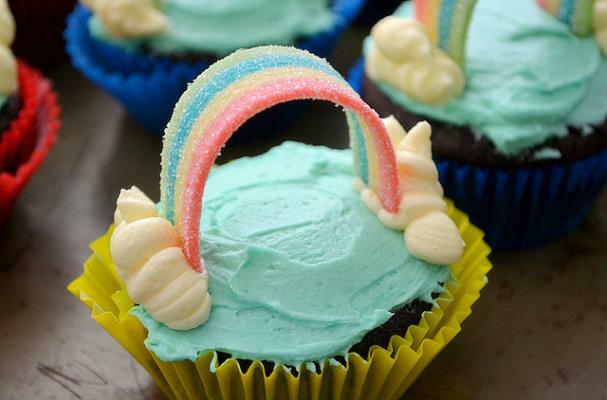 These "somewhere over the rainbow" cupcakes are the perfect dessert to serve at a Wizard of Oz themed party. All you need are a couple of ingredients and some creative intuition to bake these colorful cupcakes at home. The directions suggest using a boxed cake mixed to make this project easy but if you have a favorite cupcake recipe, by all means use that. White cupcakes are frosted with blue icing to resemble the sky and are then topped with vanilla clouds and a candy rainbow. Any fan of the classic movie are sure to fall in love with these rainbow cupcakes. Bake the cupcakes according to the directions on the box. Meanwhile, use the blue food coloring to make one of the containers of vanilla frosting pale blue. In a pastry bag (or plastic zip top bag) with a star tip place the vanilla frosting. Depending on the size of your rainbow belts, you may have to cut them into halves or even thirds. Once the cupcakes have cooled, frost them with the blue icing. With the pastry bag, pipe a few "clouds" on either side of the cupcake. Arch the rainbow belts so the ends are on top of the clouds. You are using my image without permission. While you linked to me, and I thank you for that, my cupcakes are vegan, and made from scratch, not from a box and tubbed frosting. I would prefer you use a non-vegan item with your article, or change your text to mention my cupcakes are not at all like yours. Thank you for cooperating. And if I may add one more thing---for that party, I baked three dozen cupcakes, each a different flavor with different decorations. All were made from scratch, including the frosting. It took several hours, easily more than five or six. In one fell swoop, you cheapened my hard work for that party, so I'm taking it rather personally, especially since I always make three or four dozen cupcakes, all different flavors, for every party we host. That's all I'm saying about this matter. Please change the text to reflect the truth, or use a different image. I did a Google search, and there are many "over the rainbow" images from which you can choose if you'd rather not comply with my request. I am sorry I have offended you by using your photo. It was not my intention to minimize the amount if time to create your products. At the time of the posting, the photo was selected from a creative commons license search. I will happily replace the image. My Apologies. Thank you for your cooperation. I am not offended at the use of the picture. It's flattering that you thought it worthy. What is bothering me is the way the text is written to imply that the cupcakes in the picture are from a box and a tub when they are not.